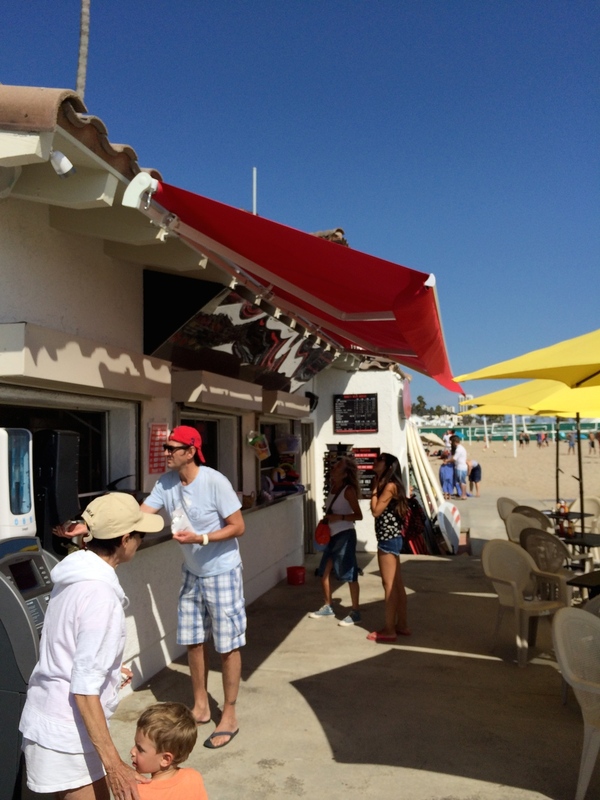 Good news on our beach: Perry's Café! Much of BOCA and SMCCA's work on the beach has dealt with fixing problems (sand in the tunnels! graffitti! loitering! burnt-out bulbs! flooding!) so it's a pleasure to report on a really positive development, and one that came as a surprise to the community: Perry's Cafe has come to our corner of Will Rogers beach! The facility opened three weeks ago in the old concession building that has long been more of an eyesore than an amenity. Its bathrooms were old and unappealing (compared to Santa Monica's spiffy new beach bathrooms) and the food concession was run-down and sold mediocre fast food. And even that space had been empty for some time, creating a feeling of abandonment. Fast forward to July 2014: a shiny new snack bar with healthy food and drinks (click here for the menu: Perry's CafeMenu ), bright yellow umbrellas, comfortable table seating and chaise lounges, and useful rentals for visiting family and friends: chairs, boogie boards, bicycles, towels, etc. Perry's Cafes have an excellent reputation up and down Santa Monica beach and beyond, but there has never been one this far north. Now we have our own, thanks to a new contract with LA County Beaches & Harbors. We've been critical of the County for its lack of attention to our area - rusting railings, weeds, and general neglect - but we have to congratulate them on the decision to bring in a new Perry's.